The New York Times is capable of fact-checking dubious or incomplete claims and it's capable of sustained reportorial attention--just not enough when it comes to Atlantic Yards. Imagine if, say, the Times had similarly fact-checked the projection (according to a document by developer Forest City Ratner) that Atlantic Yards would be finished by 2015, given that the official date is 2016 and the the timetable is already behind schedule? Or if the Times had reminded readers that the claim of 15,000 construction jobs really means 1500 jobs a year over ten years? Or if the Times corrected the multiple claims, which it reproduced uncritically, that Atlantic Yards would be built on the "same site" as the proposed new Brooklyn Dodgers stadium? Or if the Times, belatedly but responsibly, corrected the flagrantly inaccurate 12/11/03 claim, by then-architecture critic Herbert Muschamp, that the project site "is now an open railyard." Maybe it's tougher to correct your own mistakes, but the Times has had a significant impact on framing the Atlantic Yards story. Part of what makes for solid reporting is sustained attention to a story or beat, and the Times's coverage of Atlantic Yards has too often been lacking. A capable political reporter and alumnus of the Washington Monthly, Confessore had joined the paper at the end of 2004 but had no particular expertise regarding Brooklyn or development disputes. His first two major articles, on the "modern blueprint" and changes in jobs and housing, were quite flawed. Remember, the Times let Forest City Ratner's Jim Stuckey claim that opponents' criticism was "Orwellian, almost." Stuckey should know from Orwellian. Confessore eventually provided some more responsible coverage, such as about blight, and even challenged then-Empire State Development Corporation Chairman Charles Gargano. 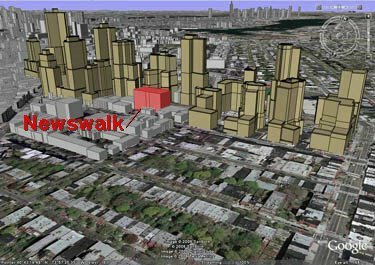 And he probably was not responsible for the Times's failure to include any graphic showing the project's scale in neighborhood context--though (I speculate) a more veteran--or foolhardy--reporter might have been more willing to challenge his bosses on the issue. And once the project was approved last December, Confessore was gone, promoted to Albany after 15 months. Atlantic Yards, apparently, was a done deal and didn't require sustained scrutiny. Since then, the Times has mostly steered clear of the story, failing, for example, to cover the hearing on the state lawsuit challenging the environmental review or the investigation of the collapse of the Ward Bakery's parapet. Still, when the Times was handed a scoop by Assemblyman Jim Brennan, Confessore was temporarily reassigned to write that July 1 article in AY financials. A 15-month assignment is rather brief and apparently not the norm. Recently, Times Regional Editor Jodi Rudoren, who oversees coverage of New Jersey, Connecticut, Long Island and upstate New York (and has nothing to do with coverage of Brooklyn) suggested, in a Talk to the Newsroom feature, a longer tenure for Metro reporters. One of the cool things about journalism careers is that there's no clear hierarchy or path, particularly among the reporting ranks. The key thing is to keep it interesting and challenging as long as possible, but the order of how that might work is up to the individual. ...We certainly have real specialists on the staff... but in general, The Times places a high value on generalists, and most people tend to switch jobs every three to five years. I think that's mostly a great thing, though it does occasionally leave us vulnerable on some beats. And if they switch within 15 months, well, there's even more vulnerability. Brooklyn's a big story--it would be the country's fourth-largest city in terms of population, and projects like Atlantic Yards, the New Domino in Williamsburg, the Coney Island rezoning, and more could keep reporters busy for a while. Unfortunately, Brooklyn College journalism professor Paul Moses's observation about the borough's place in the mediascape again bears repeating: repeating: Nowhere in the country do so many people get so little local coverage.